The Case Against Donald Rumsfeld lays out the evidence that high–level officials of the Bush administration ordered, authorized, implemented, and permitted war crimes, in particular the crimes of torture and cruel, inhuman, and degrading treatment. Using primary source documents ranging from Rumsfeld’s “techniques chart” and Iraqi plaintiffs’ statements to the testimony of whistleblowers and key pieces of reportage, the book sets forth evidence of a torture program that took place throughout the world: in Afghanistan, Iraq, Guantánamo, secret CIA prisons, and other places unknown. The accused are accorded a defense drawn from their memos and public statements. Readers are allowed to judge whether the Bush administration has engaged in torture and whom among the administration to hold responsible. 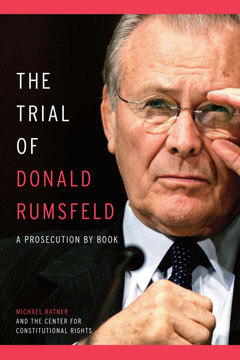 Reminiscent of Christopher Hitchens’s bestselling The Trial of Henry Kissinger, The Case Against Donald Rumsfeld constitutes one of the only attempts to hold high–ranking Bush administration officials criminally responsible for their actions.